For the sake of this review, though, instead of tossing the book aside and attending to what I thought would be the better writing of my High School Freshmen's To Kill a Mockingbird Essays, I stuck with Resurrection, and let me tell you, this decision made all the difference. Once the expository details were established and put aside, Dayton began to show her real talents as a writer. From truthful character development to gripping action scenes, from a thought-provoking rewriting of history to expansive alien worlds, Dayton has created a fast-paced, fun to read 422 page Science Fiction epic that I ended up devouring in less than a day. Through an intricate narrative structure that expertly builds drama through the manipulation of time, Dayton has built a engaging story in a completely realized world populated with believable and remarkable characters. The sophisticated plot revolves around three central ideas: a war between two alien races, the Kinley and the Lucien; an early Kinley expedition to Earth during the time of the ancient Egyptian Empire; and the search for a lost technology in the modern world that could put an end to the alien war. The intersection between the three ideas pulls the novel together. Dayton is able to do this all seamlessly through her characters. As the plot unfolds, the conceits of “good guy” and “bad guy” break down as everybody ends up having to do awful things in pursuit of their goals. One of the main characters is Pruitt, a female Kinley solider, who endures both emotional tragedy and some serious beat-downs in her quest to find the tech that could save her world. She is a heroine that you care about, displaying all the right attributes of empathy, intelligence, and bravery. Dayton layers her with enough flaws and vulnerability, though, so that you understand her motivations. As with the rest of the “aliens” in this novel, she is completely human. I was a little worried that the flashback sequences re-framing the creation of the Great Pyramids of Giza would end up being a little too “new-agey” for my tastes, but, once again, as in the rest of the novel, Dayton's characters become the central focus of this part to such an extent that any sort of spiritual “touchy-feely” stuff gets subsumed into the development of the narrative. It's really great stuff and, in its own way, completely engaging and believable. 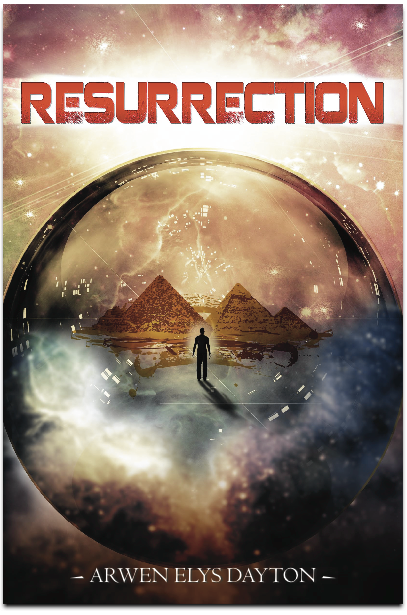 Arwen Elys Dayton has really pulled off a great story here with Resurrection. It's fun, engrossing, fast-paced, and pure entertainment. I understand why Amazon has tagged this novel to be a part of their initial slate of Sci-Fi books they're publishing under their 47North imprint.